Cedaredge, the “Gateway to the Grand Mesa”, the world’s largest flat top mountain, Eckert, Austin, Cory comprise the Surface Creek Valley in Delta County. The entire valley offers panoramic views of mountains, mesas and river valleys. Our unique location has a delightful four-season climate, tempered by the 6100 foot elevation. Endless Western Colorado outdoor recreational activities for all seasons – hiking, fishing, hunting, stargazing, camping, ATVing, bicycling, climbing, horseback riding, nature viewing, snowmobiling, and cross country skiing. The Grand Mesa has over 200 lakes for summer fishing and winter ice fishing. 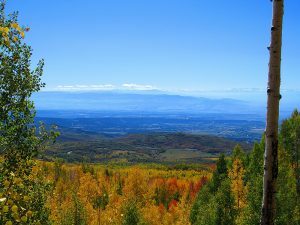 Enjoy scenic driving along the Scenic By-Way along Highway 65, also just minutes away from public lands including the Grand Mesa National Forest. 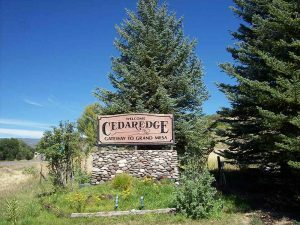 Cedaredge and the Delta County communities are not far from many of the country’s premier resorts including Aspen, Vail, Crested Butte, Gunnison, Glenwood Springs, Ridgway and Telluride. Cedaredge still retains a friendly, small town atmosphere and lifestyle. Unique boutiques, art galleries, antique stores and local wineries and fruit stands PLUS, many varied recreational opportunities are available. Cedaredge 18 Hole Golf Course boasts a challenging course and beautiful surroundings. Check out Pioneer Town, a unique frontier museum, or plan a springtime visit to check out the annual migration of Greater Sandhill Cranes. Cedaredge host the longest running Little Britches Rodeo in the country. We have convenient access to airline and rail transportation in Grand Junction and Montrose, approximately an hour away. Please visit westerncoloradoliving.com for additional information in our area, and the many things Western Colorado has to offer! Please Contact one of our Broker Associates, they will be happy to help you.